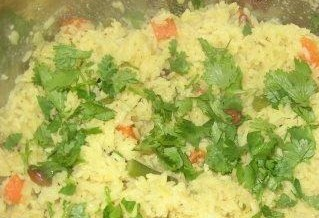 Rice with mint flavor adds different taste & can be made quickly & nutritious too. Rich of nutrients! Grind together coconut, chilly,half of coriander & mint leaves. Heat pressure cooker with oil, add curry leaves, cumin & mustard seed, once crackle add ginger-garlic paste,pepper,clove- cook further 1 min & then add onion. let it golden brown. Now pour the coconut paste, mix it . now add all chopped vegitable & peas, again mix it , add salt & rice . Pour the water to pressure cook the rice.allow 2 whistle of cooker & then remove it from fire. once cool place it in a large serving bowl, garnish with remaining coriander & serve it with sambhar or curry. hi jasber, thanks 4 the query, yes dear u can use rice cooker for making the recipe. HI ca I use a rice cooker instead of pressure cooker?! !